*Reclaim the Beats* is a festival with a focus on music genres created by Black, POC and queer people. These genres are House, Techno, Rock & HipHop. Each day will begin with films, workshops/discussions and end with concert performances from fresh modern day artists who are continuing the legacy. The purpose is to empower POC and Queer people and to further educate other participants in a media industry where the cis white male image dominates and controls access within these genres. Opening night of the festival, with short introduction from special guest eLBee Bad on the festival topic and goals. Afterwards a concert and after party. The Prince Of Dance Music eLBee BaD speaks on his experiences in the business of music, and the effects of not having white privileges. With several vinyl releases and performances over the last 20 years, this legend shares perspective on the difficult realities of being black in a white dominated business. Some topics will include: DJ Bookings, venue relations, record companies and distribution. There will also be some short films and excerpts. We will close out with an open stage event for spoken word and HipHop soul from the community. A critical look at cultural appropriation, commodification, ownership and re-contextualisation in arts and music. Who and what is affected? Who and what is allowed? How does usage and intent affect how we feel about it? With transnationalism within the arts being promoted from many corners, how do we keep creating with awareness, sensitively and integrity – or this is this an impossible position? Come ready to have your energizer buttons activated. Claiming space from the oringinations of dance and beyond, you are guaranteed to sweat with this team of jockeys. Sweating guaranteed! Sounds from eLBee BaD, Mike Starr and Ahmad Larnes from the group Schwarz Don’t Crack. From neighborhood bands to ancient disco to analog machines to computer programs…We’re still doing it! We will bang the boxes to put the sha-boom in your bottom. Whatever circumstances have been forced on us, we always know how to make magic with what we got. From beatboxing to stomp, clap, Rap … to glitch and grime. Come shake your groove thang and a bit of that vogue vibe too! 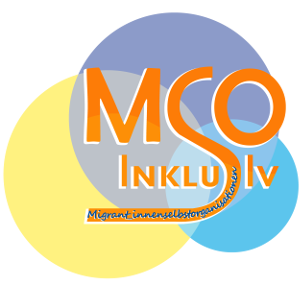 MSO Inklusiv is a project by the Migrationsrat Berlin-Brandenburg.